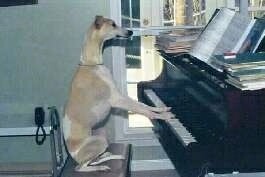 Rigby the Whippet plays the piano. Owned, trained and adored by Jenna Coleman. This is Molly, an 8-month-old Mountain Cur mix. If you look carefully, you'll notice that there is only one paw touching the wet ground at the time of this photo's exposure. This is Kodak doing his favorite thing—jumping! This is over a horse fence at a stable. 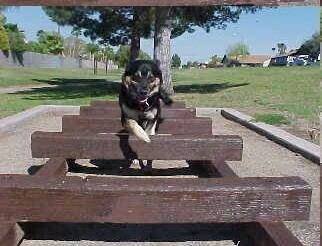 Kodak also loves to go on rides, loves the dog park, pulls his owner in a wagon or on roller blades, and just started agility. 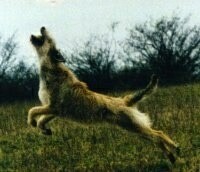 This is a Berger Picard, photo courtesy of Heike Fox. 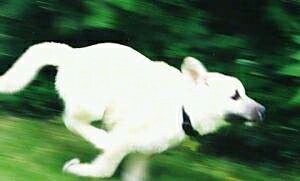 Spike the Bulldog on the run! 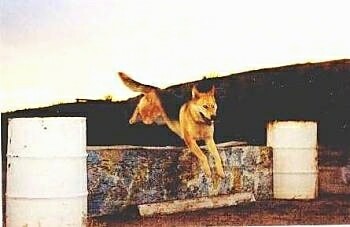 Buck the German Shepherd / Rottweiler / Husky mix on the run jumping over wooden planks! This is Jasper, a 3-month-old Norwegian Buhund puppy. 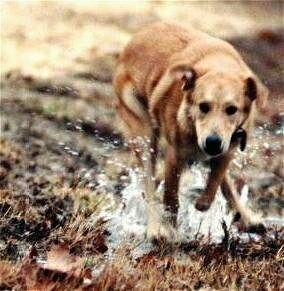 He's "on the run" too!